As Physical Education teachers, we are always looking for new ways to capture our students’ attention and engage them in our lessons. Technology is always advancing, and our students are right at the center of this revolution. With that being said, video games are probably the most prevalent source of technology that our students use. Currently, the most popular video game is called Fortnite. Although many teachers and schools have a negative outlook on the game, a themed activity can spark students’ attention and allows them to visualize bringing the world of technology to life. The idea came to me one day while preparing to teach Physical Education to Middle School students. I wanted to create an activity that would get my students engaged in the lesson. I thought about finding a way to incorporate the game Fortnite into my lesson. I did extensive research searching for ideas, but to no avail; there were no resources available. 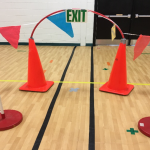 At this point I decided to take matters into my own hand and design a developmentally appropriate physical education game for my students that simulated Fortnite in the physical education classroom. I made this game to engage and motivate my students in a rolling and fielding lesson. For those of you unfamiliar with the concept of the game Fortnite, here is a quick explanation: The game has 100 players that must choose a spot on a map to land. As soon as they land, they must try to get as many resources as possible to use as weapons or to build forts. They have limited time before the map starts shrinking – making it harder to hide from other players. The objective of the game is to be the last player standing. There are many different game modes that constantly change, but I selected the “team mode” to use in my lesson. To begin the game, students are divided into two teams. Each team is supplied with pinnies with their team color. Students are then asked to find a spot in the gym and remain still until the whistle blows. Next, the teacher rolls all the balls onto the court and blows the whistle. As soon as students hear the whistle, they either run to grab a ball or try to find cover. The objective of the game is to roll the ball and hit an opponent below the knees. If an opponent is hit, he or she must stand next to their team’s cone. NOTE: Students are not permitted to throw the ball overhand at an opponent or hit them above the knees. If they do so, they are out and must stand next to their team’s cone. There are two possible ways for a student to be brought back into the game if they’ve been hit. The first way is if the ball is rolled at a teammate and they field the ball cleanly (as if you were fielding a groundball in baseball – so if the ball is rolled at them and they try to field the ball and it hits them and they bobble it and/or drop it, or if it just hits them they are out. But if the opponent is able to pick it up cleanly on a roll then they are in, they can bring a teammate back in, and the person who rolled it is out). If this happens, the first student next to the cone can come back in and the opponent who rolled the ball is out. The second way is if a student from the same team can get a blue, purple, or yellow ball in the basket. A blue ball would bring the first student next to the cone back in, a purple ball would bring the first two students back in, and the yellow ball would bring the first three students back in. The colors are important in the video game, but, if you don’t have them, you can use the same colored balls and have them make a shot from inside the key for one student, outside the key for two students, and a three pointer for three students. Another important concept is that every two minutes the “storm” shrinks. So, you will start with students allowed to go anywhere in the gym. When the two minutes are up, students must be on the basketball court. Then after two more minutes, they must be on the court but not within the three-point lines. This continues until all the students are in the center circle. This mimics the video game and prevents students from trying to hide during the entire game. Students can move the mats with them as the storm shrinks, but if they are hit while moving the mat they are eliminated. A team is deemed the winner when they have either eliminated an entire team, or have the most students in the center circle after the final two minutes are up. There can be more than two teams, but two to four teams work best. Once your students are comfortable with the rules of the game, you can do a solo elimination round to see who the last student standing is. I hope you enjoy this game and let me know how it goes in the comments below if you try it in your classroom! 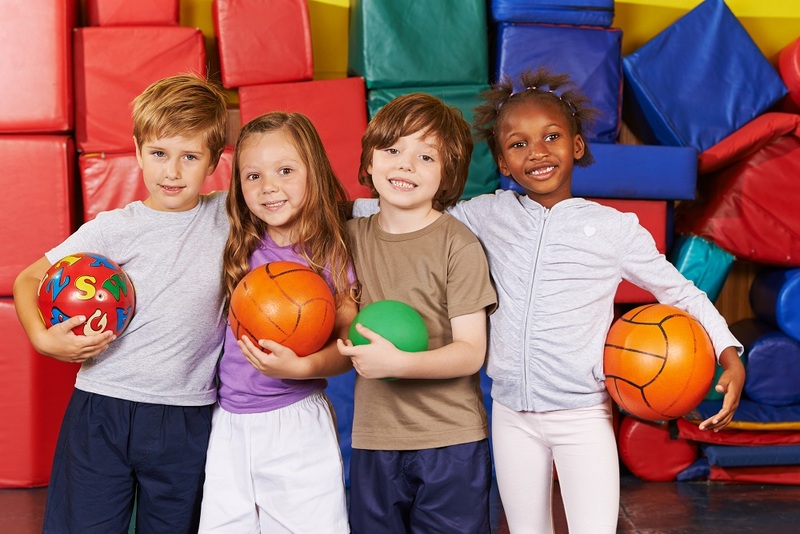 Erik Schlemm is a Health and Physical Education teacher with one year of teaching experience. Erik graduated from Montclair State University and is an advocate of incorporating interdisciplinary learning and technology into physical education classes. His School Videos YouTube channel is starting to grow so be sure to check it out. 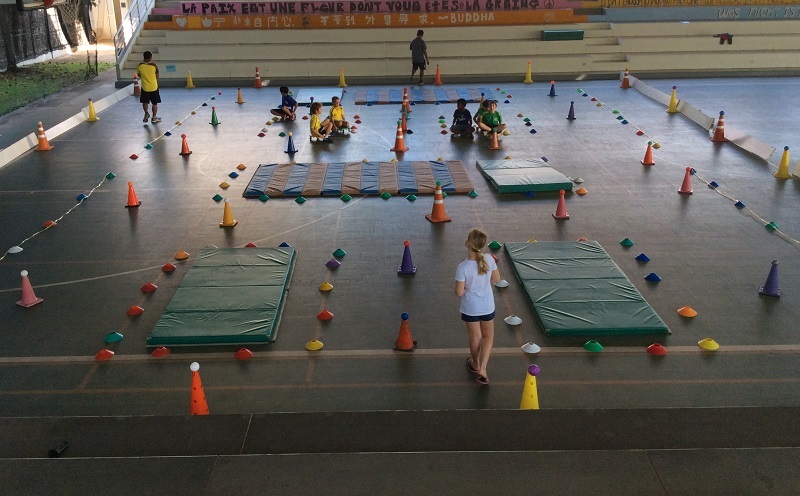 This entry was posted in PE Activities & Games, PE Central and tagged Fortnite, PE, PE activity, PE Central, physed, Physical Education by S&S Worldwide. Bookmark the permalink. Lots of questions: Can students be hit when they are behind a mat? 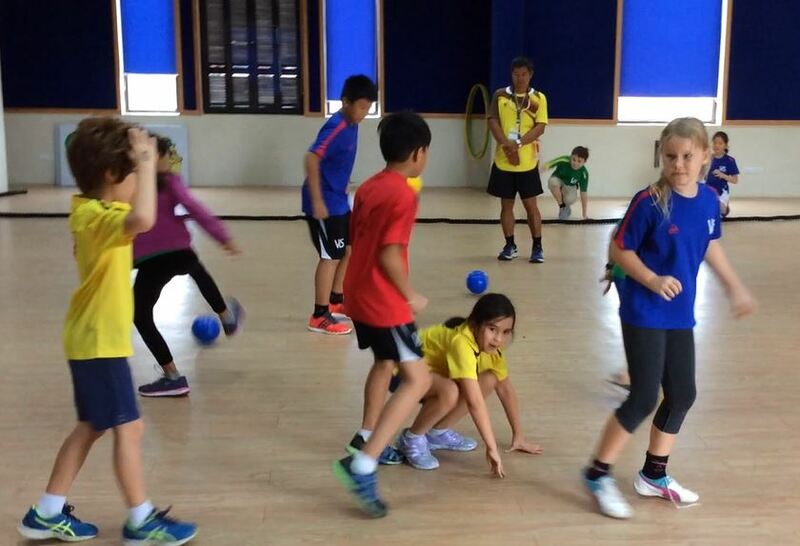 Can a student grab a ball and take cover behind a mat AND throw the ball at someone? What kind of mats do you use? I have these huge, cumbersome blue mats that fall over when I stand them or they collapse when trying to move them. Thanks! My students are big Fortnite fans. The way I play, if a student is hit they are out whether they were behind a mat or not. Yes a student can grab a ball and take cover behind a mat and then roll/throw from there. I actually have these Yuki ball barriers that are made from pvc pipe that is lightweight and durable which makes it easy to move. With that being said, you can use those and keep them folded and maybe stack one on top of another on both sides as barriers. 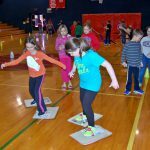 Depending on the age of the students you could let them try to push the mats to move them closer or you could just leave them in one spot for the whole game. I hope this helps and remember you should adapt the game to what works best for your gym! Sounds great and we know kids like their video game references. I can see where as the storm gets smaller they will have a much harder time making a basket. I think I will try it where they can shoot at the side baskets as well since I don’t think many will ever make a 3 pointer. Then when the storm progresses they still have a small chance to make a basket to save others. Have you tried it as a dodgeball game where they can throw it at others rather than rolling it? My kids really like dodgeball type games. I have made PVC/fabric barricades for other games and since my mats are old and don’t stand up these would work great. I like that idea to give them more options on working on their shooting skills. I usually do this because my students tend to only focus on making the baskets and making it harder throughout the round makes them have to adapt their strategy. With that being said I do teach middle schoolers and whatever you think is best for your gym you should do! I actually use Yuki ball barriers instead of mats and they are made from PVC pipe and you are right they are lightweight and very durable, especially perfect for this activity. I have not tried it as a dodgeball game but I’m sure the kids would love that aspect. Looks nice.More suitable for older students in my opinion because of too many rules.Will try it out! Do they have to stay on their own half of the gym? Does it matter what basket they shoot at? No the students are allowed to move throughout the area that is not in the “storm” and they are able to shoot on either basket but as the game and “storm” progress the farther the shot has to be! Thanks for your kind words! How are students able to recover balls that have rolled into the storm if they aren’t able to step into it? Do they only have three seconds to get in and get out with them? That is a great question! I would allow them them the three seconds like you said but they can only retrieve the ball and come back in. They can not roll the ball at an opponent while in the storm. You can also add a fitness component if you would like where the student can retrieve the ball but needs to do 5 jumping jacks before coming back into the game. Can the kids pick up the balls and move or run with it inorder to get someone out, or shoot a basket? Can they ball block a ball rolled at them? Hello Gina, yes the students can run with the balls to try to get the opponent or to go to the basket! They also can block the ball coming at them but only with another ball in their hand. If it hits their body they are then out! I hope this clarifies your questions! I am a 1975 graduate of Montclair State and am going to try your game soon. Maybe I missed it but what are the purposes of the mats. My kids love the vidoe game and I’ m sure will love this. Hello Grace! The purpose of the mats are to be used as temporary shelter from the other team. In the video game they are able to build forts to protect themselves so they can use the mat in this game for that purpose! Let me know how it goes when you try it!